Even though the tempestous Twitter tête-à-tête was shortlived, it contained a few hilarious gems. 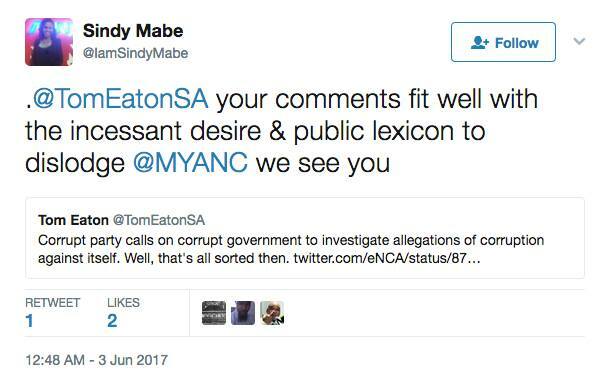 Sindy Mabe, the ANN7 primetime news anchor, probably regrets responding to Tom Eaton’s Twitter post in which the well-known satirist exclaimed that a “corrupt party calls on corrupt government to investigate allegations of corruption against itself”. 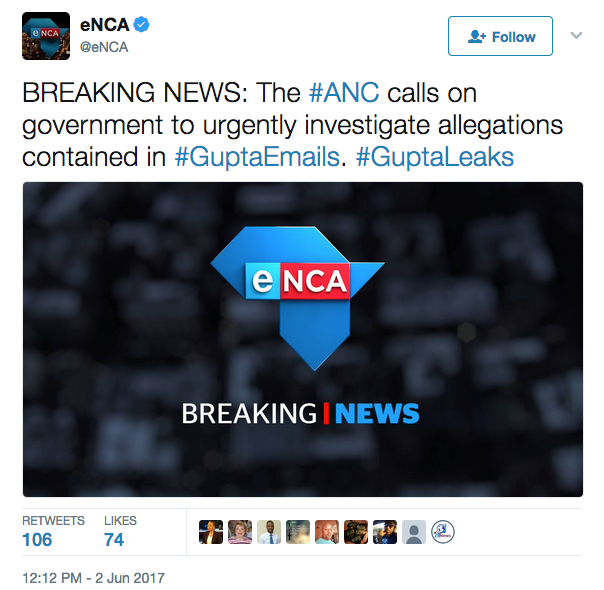 ANC secretary-general Gwede Mantashe had earlier said the party must do so because allegations contained in #GuptaEmails and #GuptaLeaks were serious and failure to do so would erode government’s credibility. ANN7’s newsreader was ticked off with Eaton. Eaton wasted no time responding to Mabe’s statement. The clapback was so spicy, Mabe has since gone underground on the issue. “Day made: Gupta TV’s shill tries the old ‘we see you’ routine when I suggest – gasp! – that the ruling cabal is utterly corrupt. “I’m intrigued by the ‘we’: who do you think they are? A committee of bought PR spokesmuppets pretending to be journalists? A coterie of toadies who spend their days with their lips pressed to Gupta buttocks? Or just her and her imaginary friend?” he asked. Another spectator, Delme Cupido, on the other hand, simply wanted to know what ‘public lexicon’ meant. Eaton was not yet done with raking the media house’s employee through the coals. “Sindy doesn’t seem to realize that a less pretentious way of saying ‘public lexicon’ is ‘everyone is talking about’ removing the ANC. Because, well, duh,” he explained.